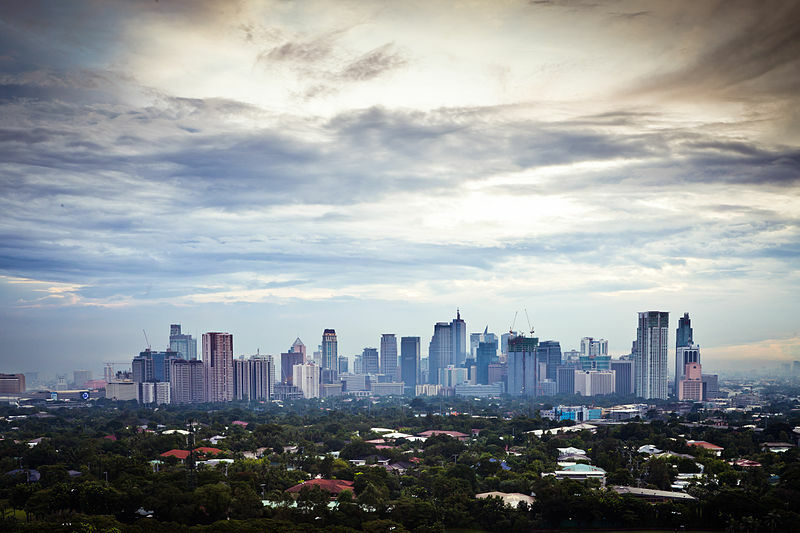 The ever-growing Makati skyline. File photo via Wikimedia Commons. This week the National Economic and Development Authority (NEDA) of the Philippines painted what could best be described as an overly optimistic picture of the Philippine economy for 2018-19. Rosemarie Edillon, NEDA Undersecretary of Policy and Planning, said at a press conference that one reason for NEDA to project the Philippines to be an “upper-middle income nation by 2019” stems from the 8.4 trillion pesos President Duterte plans to spend on infrastructure. But that ignores some serious economic numbers that have already been released. Data released by the Philippine government earlier this year showed that the unemployment rate for 2017 was 5.7 per cent. This was well behind their expected range of 5.1 to 5.4 per cent for 2017 and slightly higher than the rate for 2016, which was 5.5 per cent. This is further supported by numbers coming out of the Philippine Statistics Authority. According to the PSA, the preliminary employment numbers for 2017 are showing a decline of nearly 663,000 employed Filipinos as compared to 2016. In terms of the overall percentage of employed Filipinos that is a decline from 94.6 per cent in 2016 to 94.3 per cent in 2017. Further pushback against the optimistic outlook can be found in a January 2018 press conference held by the executive director of the IBON Foundation, Jose Enrique “Sonny” Africa. The press conference, which focused primarily on the negative effects of the Tax Reform for Acceleration and Inclusion (TRAIN) Law, Mr Africa said that the country’s agricultural sector was suffering greater employment losses than the government had acknowledged This, he said, was due to an ageing labour force and unattractive wages. Mr Africa went on to claim that the actual number of unemployed Filipinos exceeds four million, which is significantly higher than NEDA’s estimate of 2.4 million. Even if the actual unemployment numbers were closer to those estimated by IBON Foundation, that would only strengthen NEDA’s belief that the infrastructure projects would offset that and lead to a decline in unemployment. But there is still the question of “where” the money for those projects comes from. According to the government, approximately a quarter of the money needed for the eight trillion-plus programme will be generated from the implementation of TRAIN. Additional funding is currently being sought through loans and grants from other nations. With the exception of existing infrastructure investment by Japan, the Duterte administration is looking to China to help make many of these projects happen. This could prove to be a major mistake. While China is currently a major player on the world stage with their “One Belt One Road” multinational infrastructure project, along with several development projects in Africa, it could very easily come to a sudden halt. According to a number of financial and global investment watchdogs, there are growing concerns over the viability of China to maintain its economic growth. These concerns come from worries that their real estate market is overheating due to overvaluation. This is due to excessive and insupportable development, the growing debt load of Chinese companies and over-leveraging in the financial industry. This scenario is similar to what led to the financial crisis in the United States in 2008. Failure in any one of these areas, which has grown in likelihood over the last several months, would start a “domino effect” that would lead to an economic crash on par or greater than that of Japan in the late 1980s. Should that happen it would leave any Chinese funded, overseen and led infrastructure projects in the Philippines “dead in the water” and any Filipinos employed by those projects unemployed. Given the projected numbers of Filipinos that could be employed by such projects it would cause a surge in unemployment exceeding the more conservative numbers of current Filipino unemployment being put out by groups like IBON Foundation. It would also effectively eliminate the optimistic growth projections being put out by NEDA and other government organisations. And this doesn’t even begin to cover the continuing losses of foreign investment due to the Duterte administration’s war on drugs, the negative effects of TRAIN on domestic industry and increasing likelihood of greater than projected inflation due to TRAIN as well. While no one wants the Philippine economy to slow or stagnate — and it would be wonderful for President Duterte’s goals for the country’s infrastructure to be realised — it is doing a disservice to Filipinos for NEDA to release overly optimistic economic projections like they did this week. A more cautious, balanced and realistic projection would better serve Filipinos than excessive optimism. Dwayne is from the USA and planning to retire to the Philippines with his wife, a native of the country, in the near future. He has spent almost 30 years in business and finance with a current focus on international business.